I just love Christmas and everything to go with it. 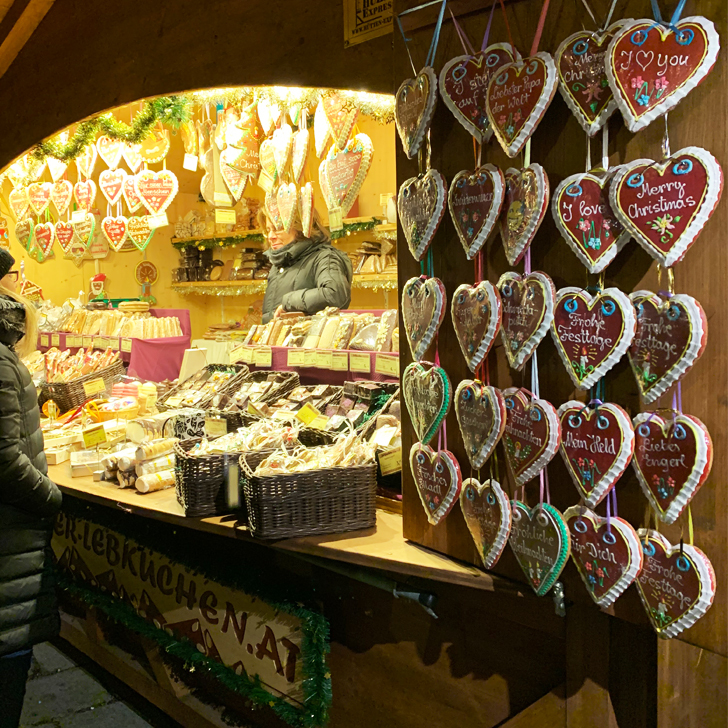 And one of the things I miss most now that I live in the UK is Christmas markets. 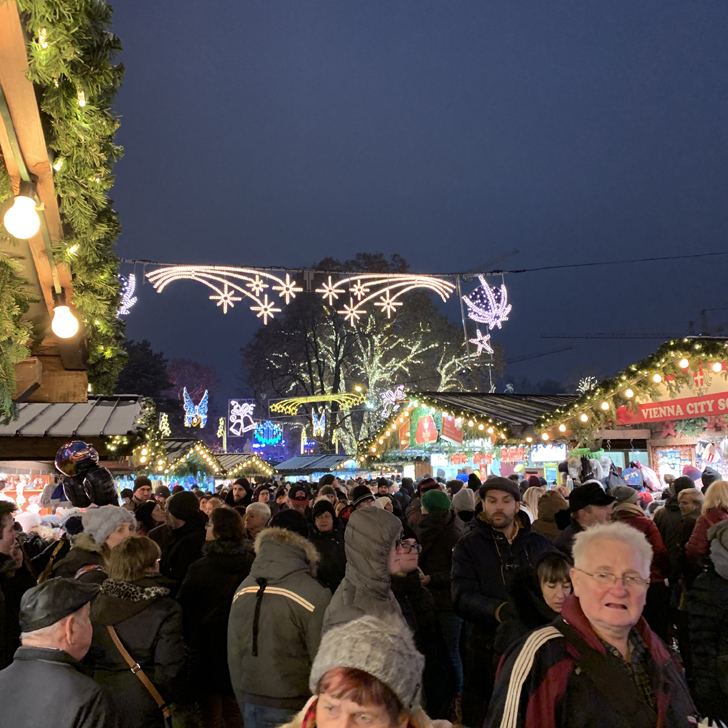 Yes, we do have the odd Christmas market in London (and a nice big one in Birmingham), but they are not quite the same as the traditional Christmas markets you’ll find in other parts of Europe. 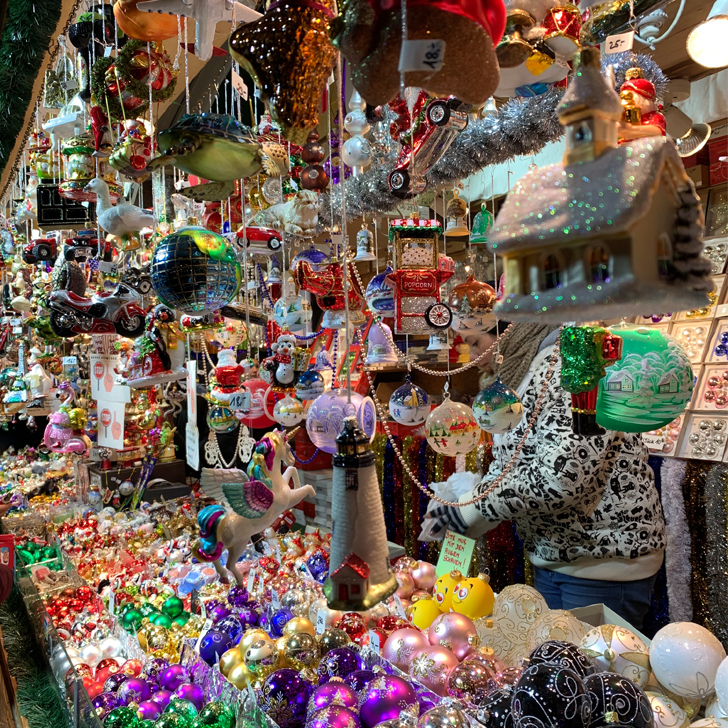 So whenever I get the chance, I love to go and explore some of the best Christmas markets whilst out and about (in the last few years I’ve been to the Christmas markets in Nuremberg, Hamburg and Vienna). 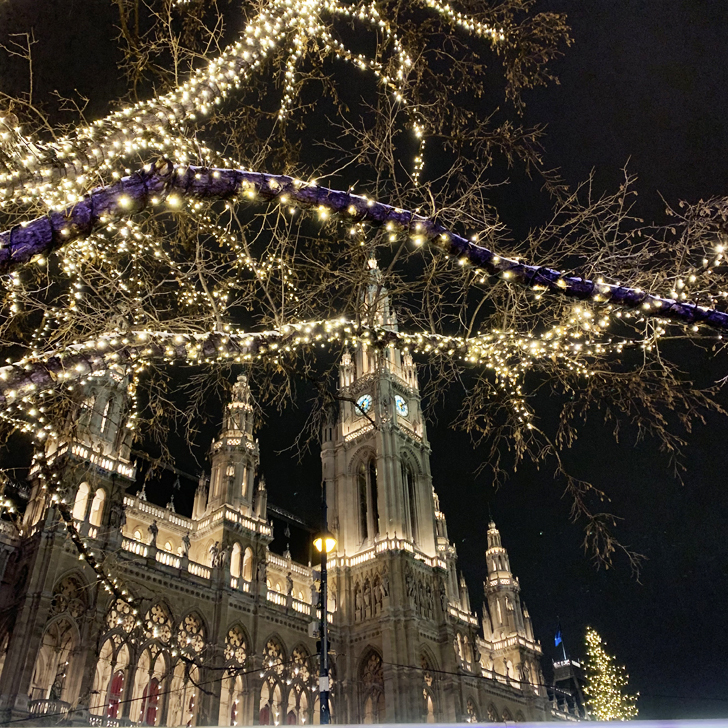 So in time for the first Advent weekend, I took the opportunity and visited not just one, but eight of Vienna’s Christmas markets with my mum. Yes, you heard right. EIGHT! 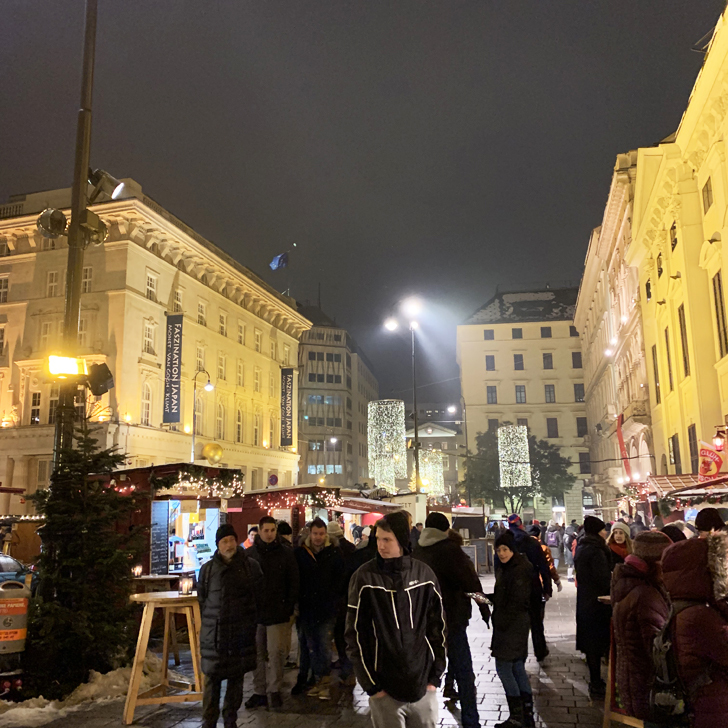 And those weren’t even all the Christmas markets Vienna has to offer. There are still some left that we did not manage (or that weren’t open yet, as it was very early in the season). 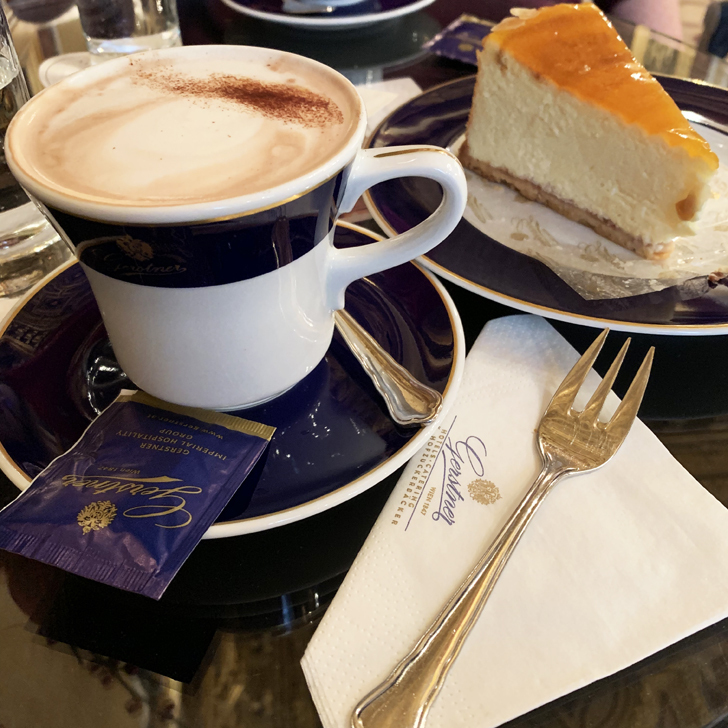 Three years ago mum and I visited Vienna for a weekend in summer. 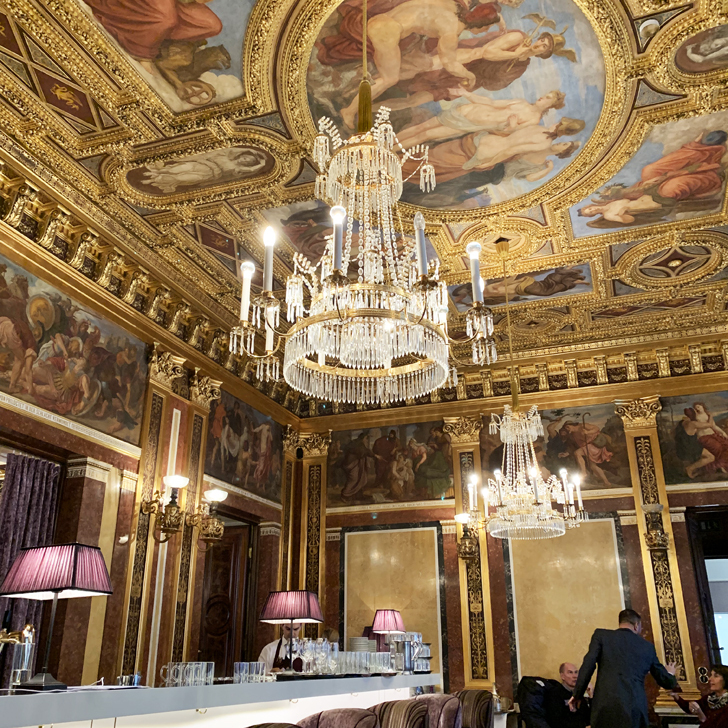 It was the first time mum had been in Vienna and she fell madly in love with the city. 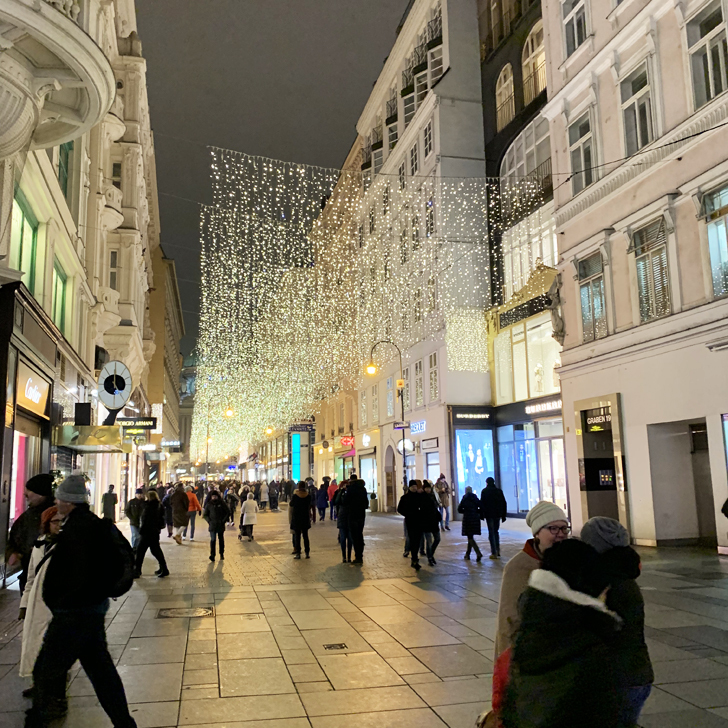 That same year I had a work trip to Austria in December and stayed in Vienna for one night. And it was just magic. 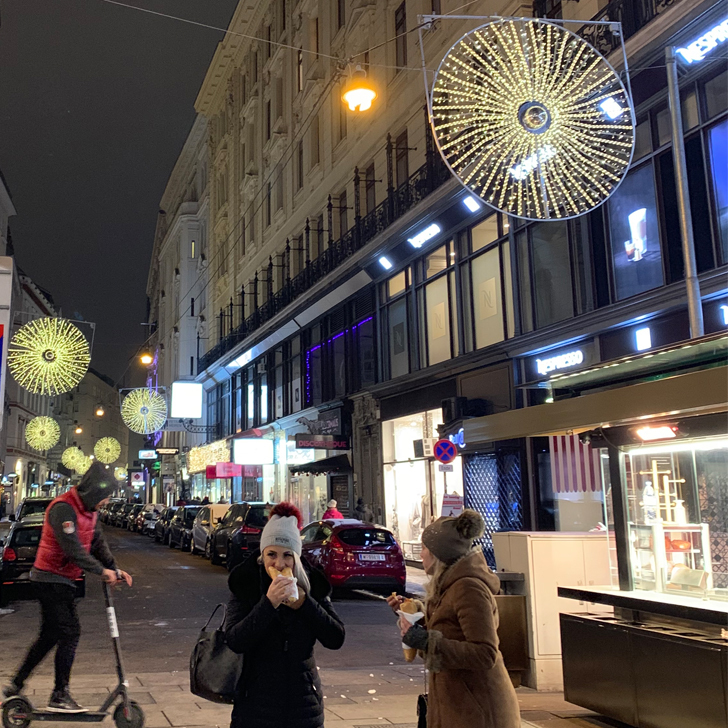 If Vienna looks pretty all year round, seeing it sparkle and decked out just transformed it into the perfect Christmas wonderland. So I promised mum we would visit it together the next year. It might have taken a little longer than originally planned, but fast forward three years and here we were. 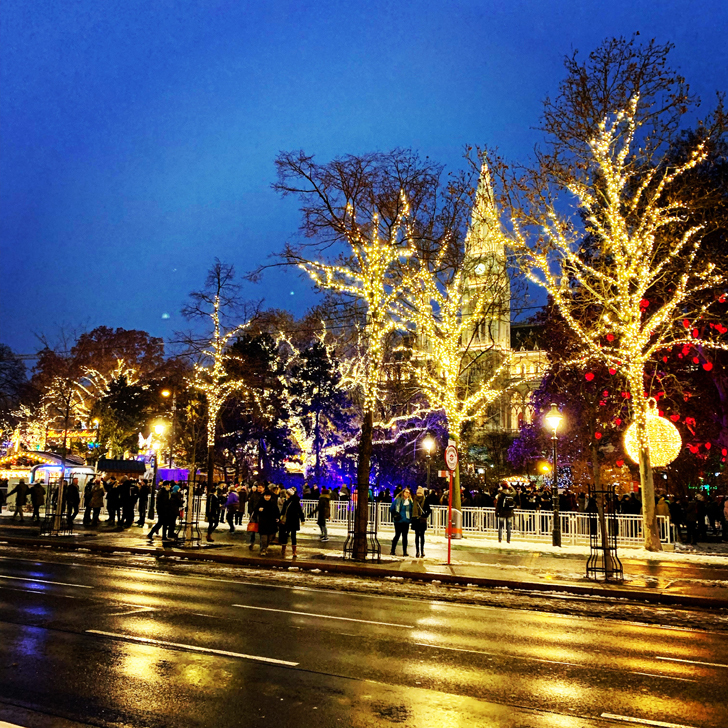 Ready to explore the very best Christmas markets Vienna had to offer. We arrived at Vienna airport midday on Saturday. Thanks to the CAT (the City-Airport-Train), getting into Vienna was quick and easy. 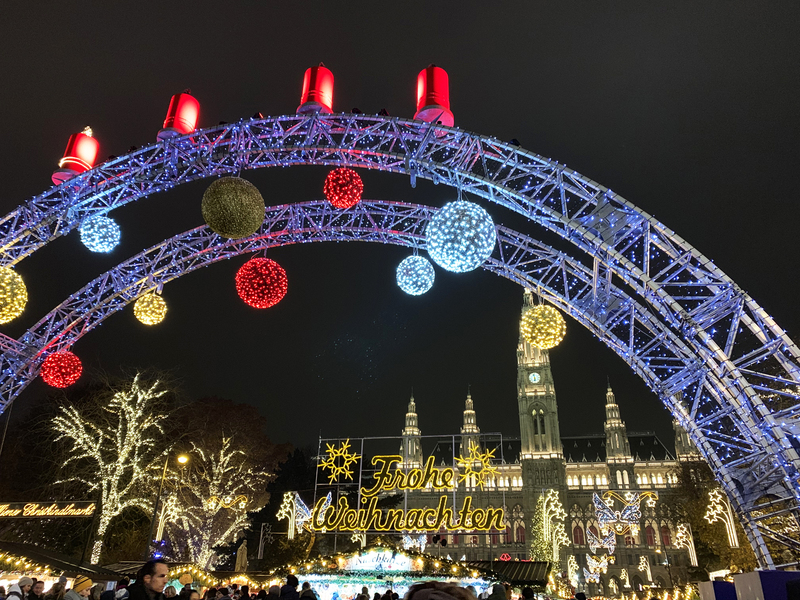 When choosing our hotel, we opted for one near the Rathaus (City Hall), for easy access to the city centre and the Christmas markets. Perfect. With check-in over and bags left in our room, it was time to start exploring. 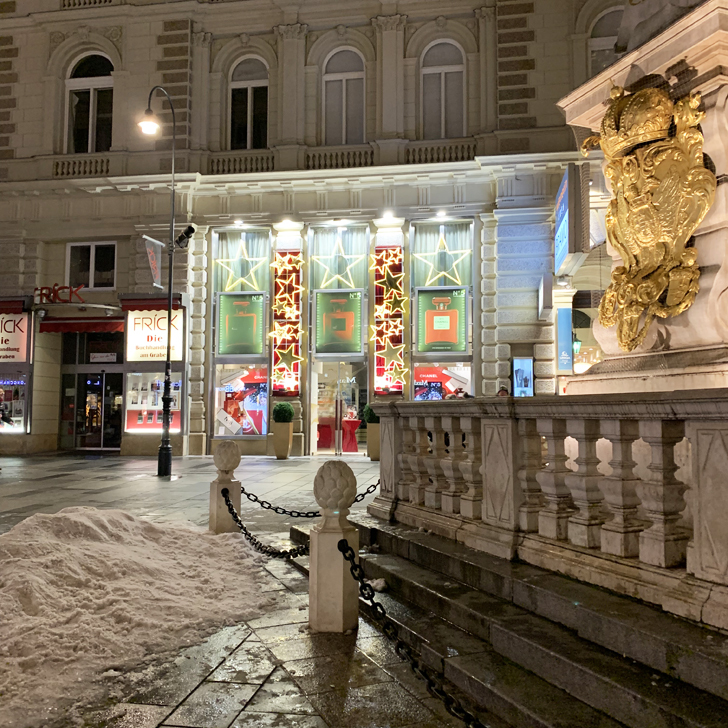 As Vienna had a bit of snow the previous day, the streets were still lightly dusted and it was a bit chilly. But we did not have any further snow that weekend (however the bits of snow left just made everything look even more Christmassy). 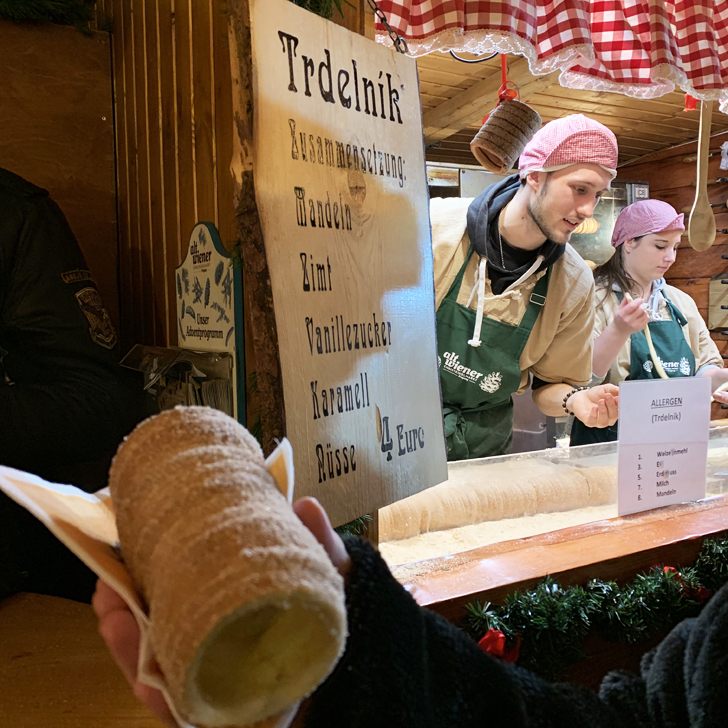 Our first stop was the Christkindl Markt at the Rathaus, as it was the closest to the hotel. 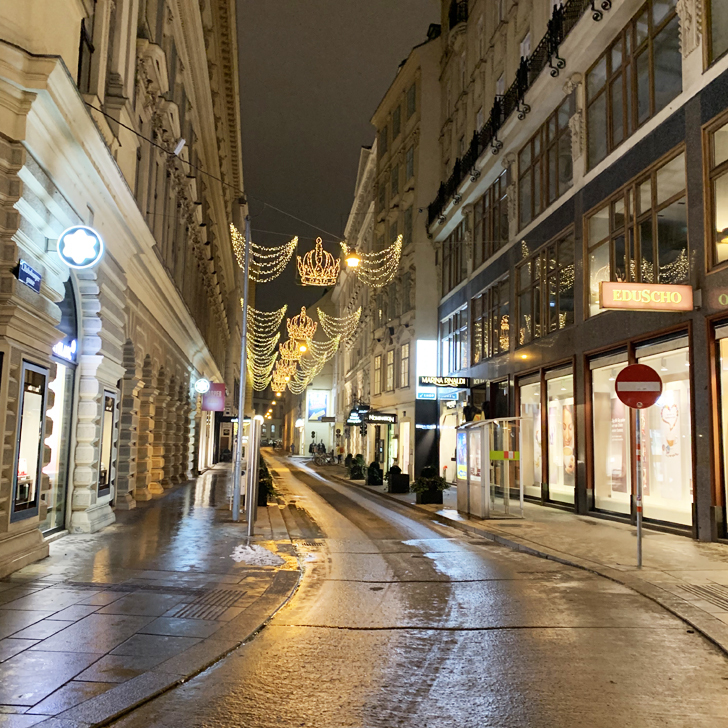 It is probably the biggest and best-known Christmas market in Vienna and especially as night sets in, it looks just perfect with all the Christmas lights. But it also gets very crowded, especially in the evening, so be prepared for that. 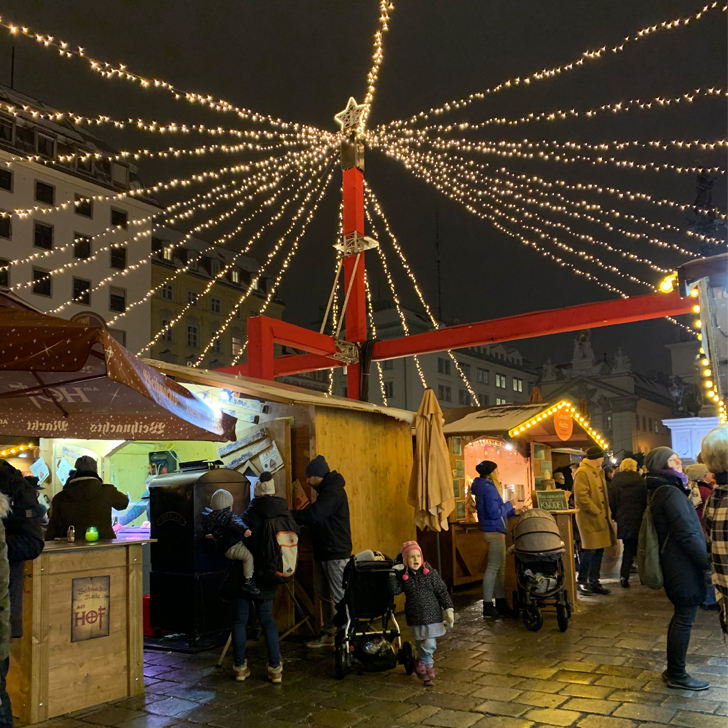 Unlike some of the other Christmas Markets, the Christkindl Markt also offers fairground rides like a Ferris wheel and two merry-go-rounds, to keep the kids entertained as well. 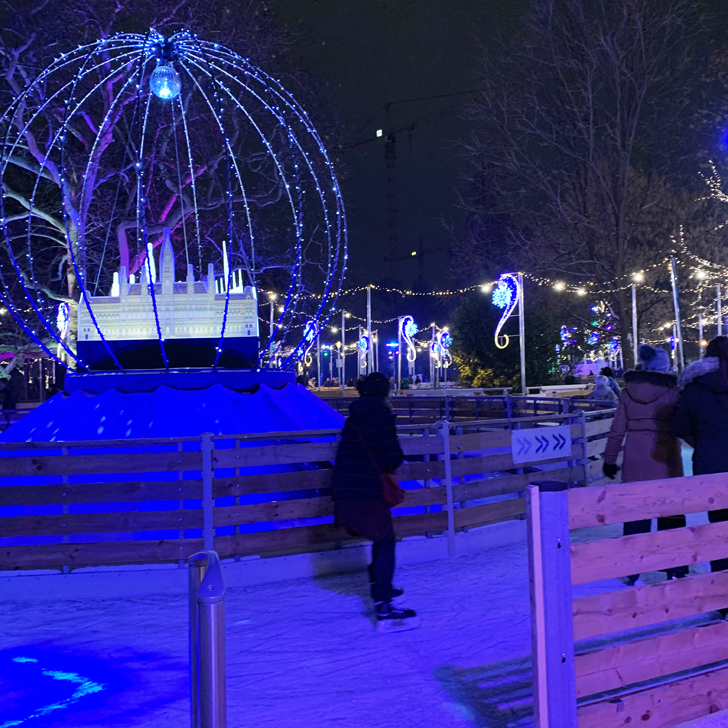 And it comes with its own ice rink, for that extra special pre-Christmas experience (no, we did not try it out ourselves, but it looked good fun and pretty with all its lighting in the evening). 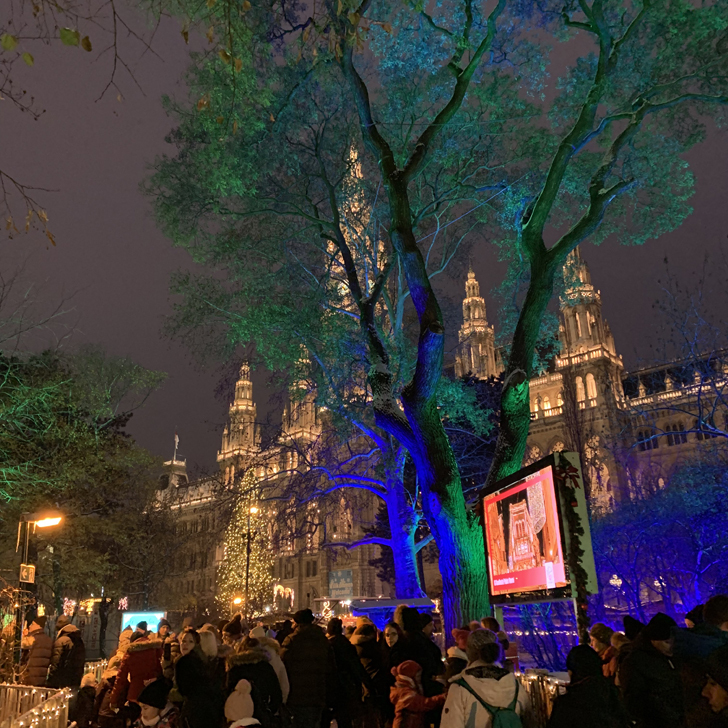 Snap a selfie under the Herzlbaum (the heart tree), have some mulled wine and eat your body weight in yummy Christmas treats. 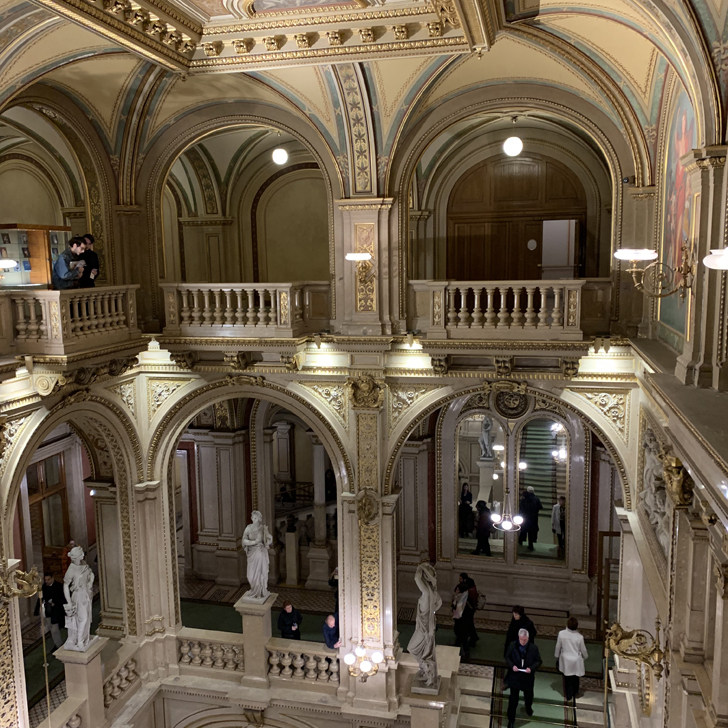 On Saturday this was actually the only Christmas market we went to, as I had a little surprise planned for the evening: a visit to the Wiener Staatsopera (the Vienna State Opera) to see ‘Madame Butterfly’. Unfortunately I left it a little late to book tickets, so at the time only had a choice of very cheap or very expensive. I opted for very cheap with ‘restricted view’. We had done that before in London and although you might have to look at the stage at a slightly odd angle, it usually turned out alright. Unfortunately this time ‘restricted view’ translated into ‘no view at all’. 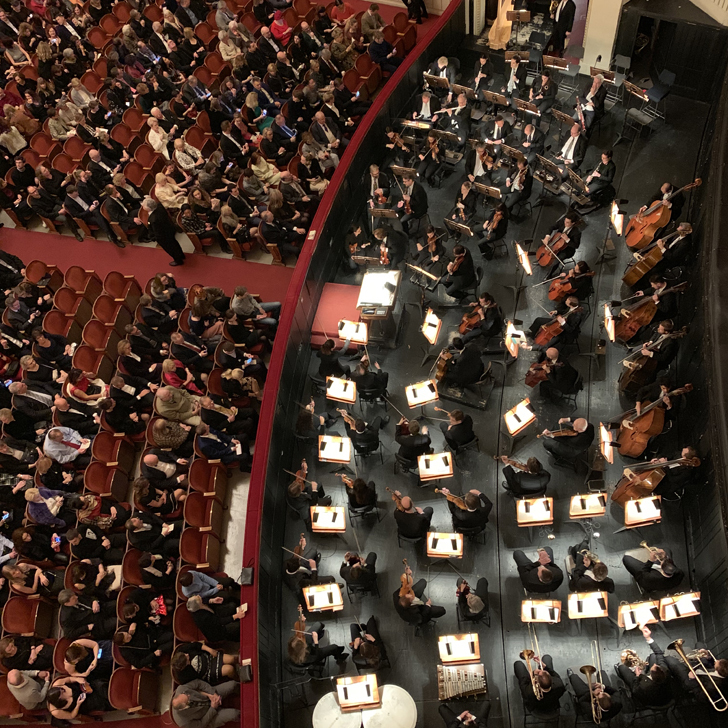 But we still had a nice evening and very much enjoyed the opera (after all, you are there for the music first and foremost). 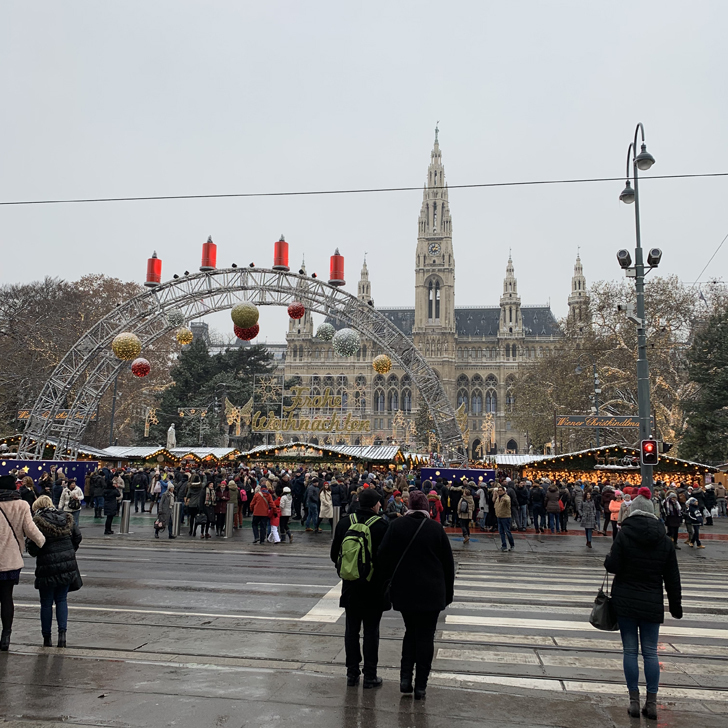 Sunday was going to be the big day were we travelled the length and width of Vienna to visit as many of the Christmas markets as we could possible find. 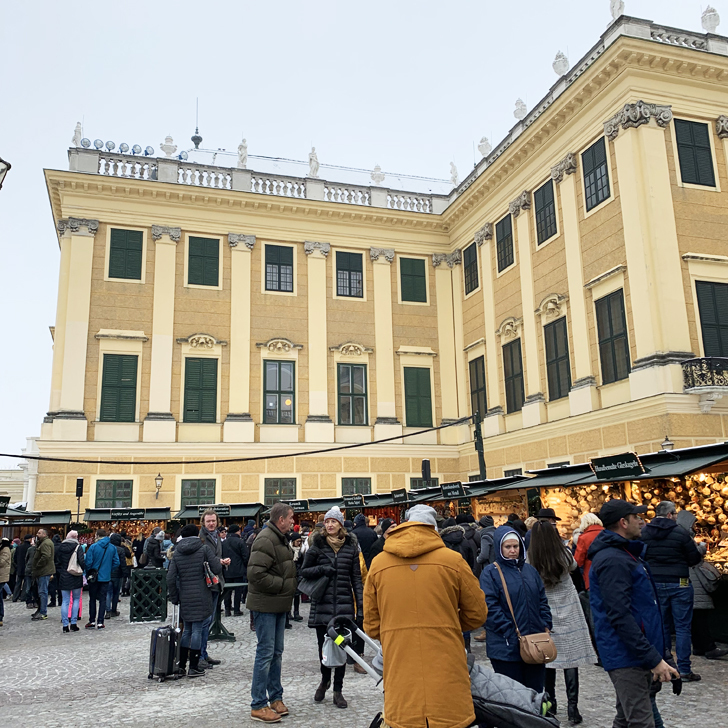 Our first stop was the Christmas market at Schloss Schönbrunn. 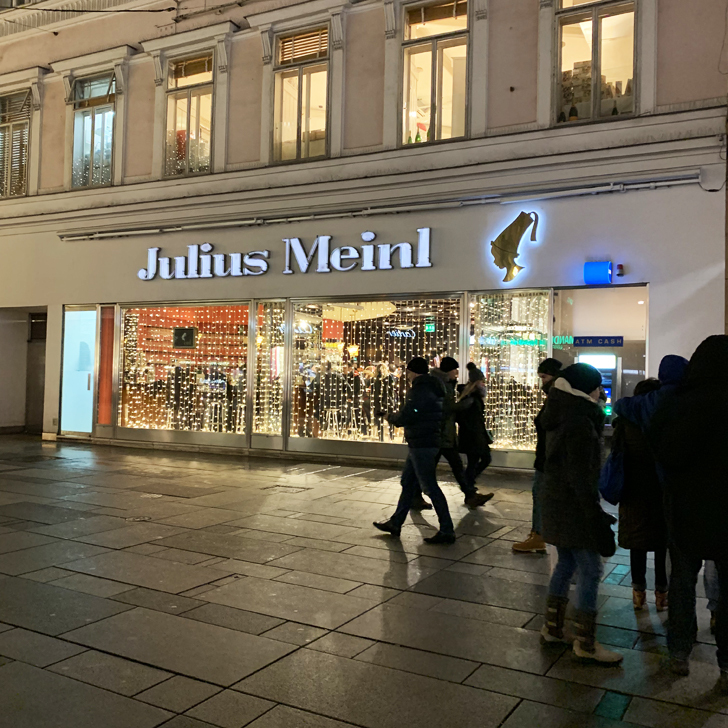 Compared to most of the other markets (Belvedere aside), this one is a little ‘out of town’, but with the underground line U4 you can get there fairly quickly. 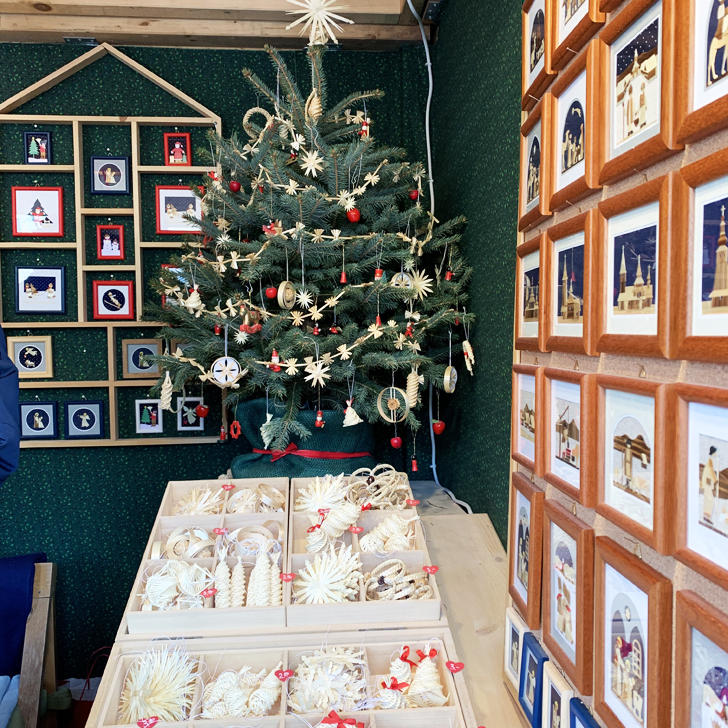 The castle provides the perfect backdrop to this picturesque Christmas market. 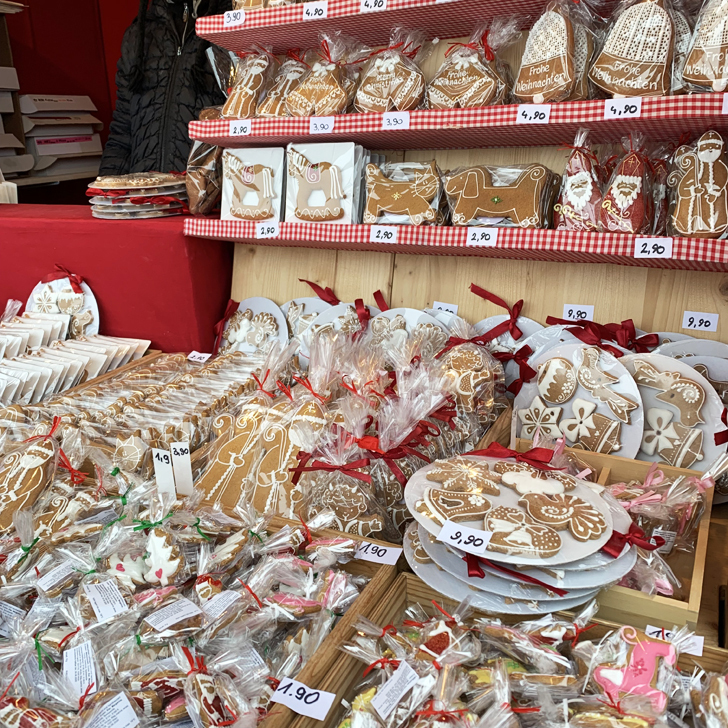 The market offers loads of regional products, from jams to cured meats, arts & crafts, handmade Christmas decorations and obviously loads of tasty snacks and mulled wines. And if you fancy some exercise after all the food, the castle gardens are just perfect for a little stroll. 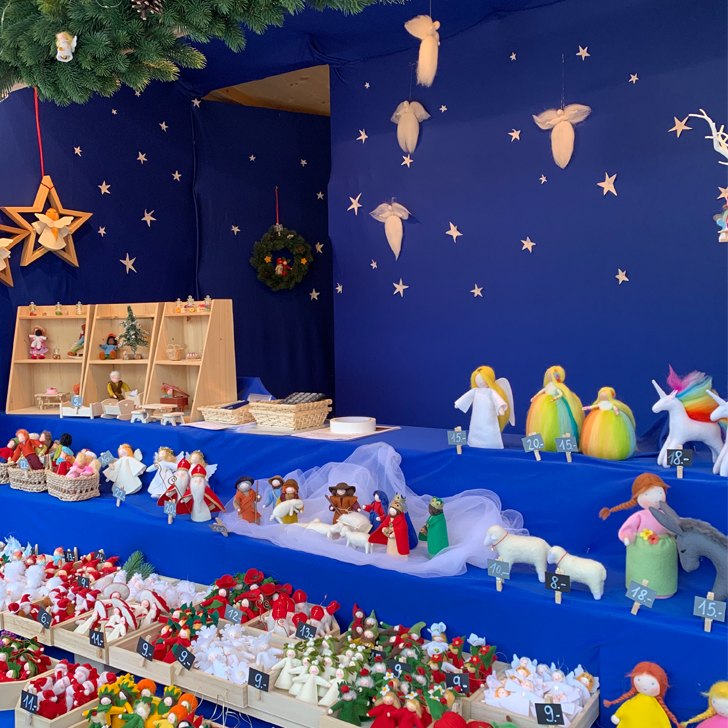 Back in the city centre, we headed towards the State Opera for a little coffee break and stumbled across another little Christmas market in the shopping arcade just opposite the Opera House. 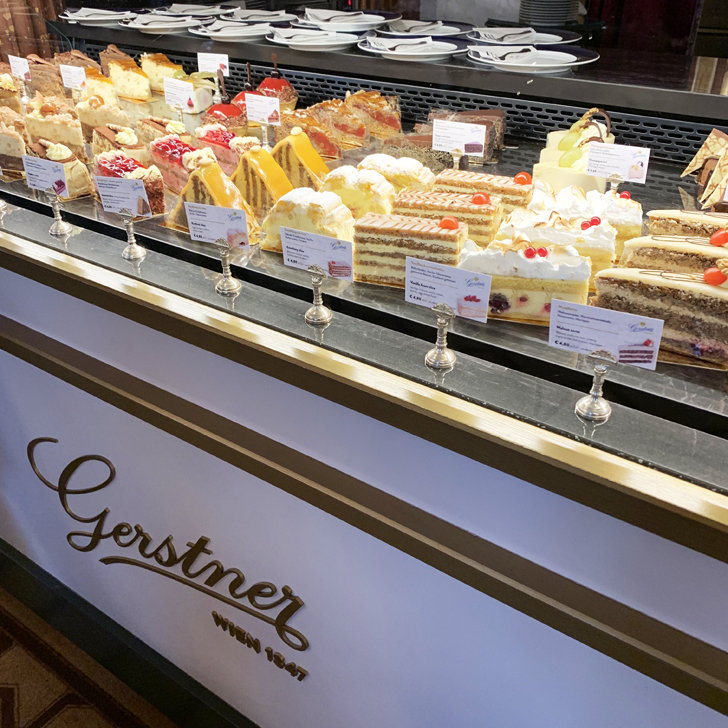 After warming up with hot chocolate and a slice of cake at Café Gerstner, we then walked over to the Karlsplatz for the third market of the day. 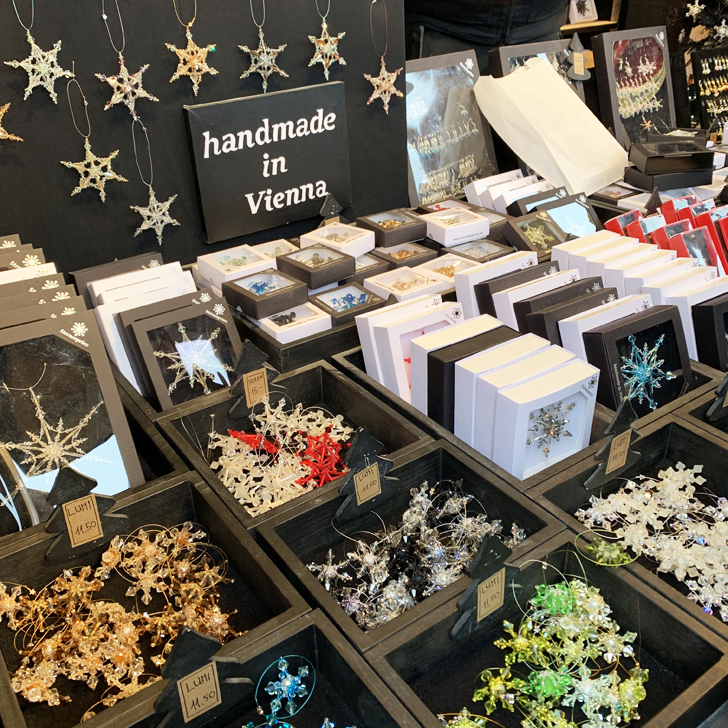 The Art Advent market in front of the Karlskirche is an arts & crafts market, celebrating its 25th year this year. 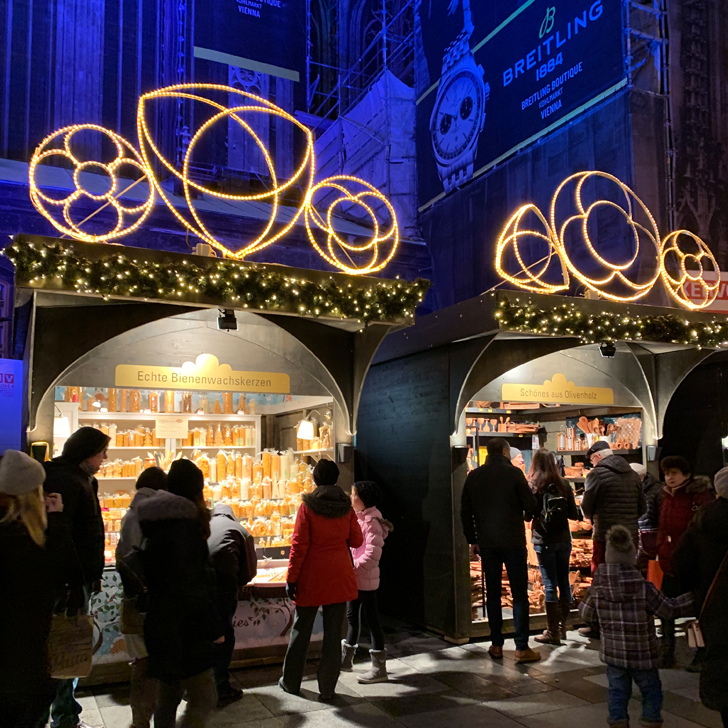 It is the only Christmas market to offer an entirely organic food selection (not that we tried any of it to be honest, we only just had cake). With a lot of activities on offer, the market was quite busy with young families and kids. 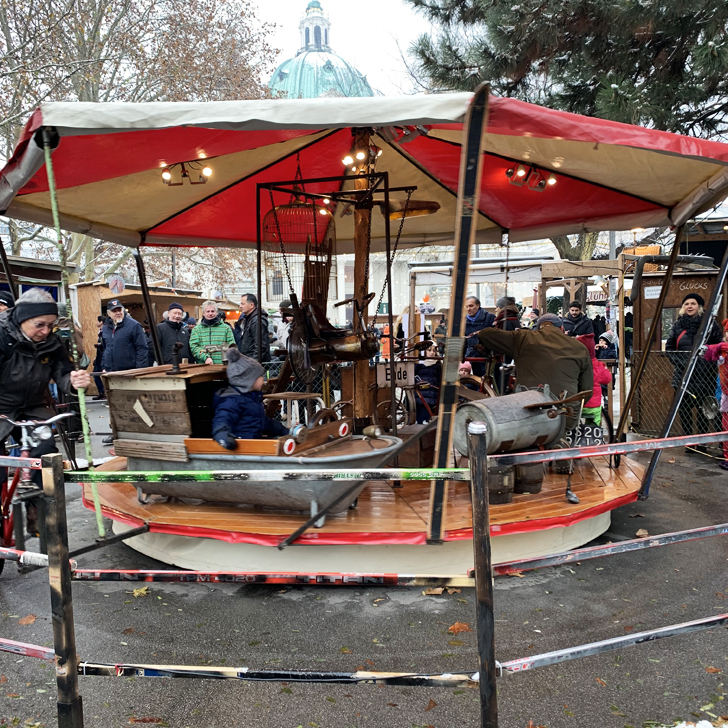 My personal favourite was the carousel of lost things, which was just so quirky and fun to look at (and entirely powered by bicycles). 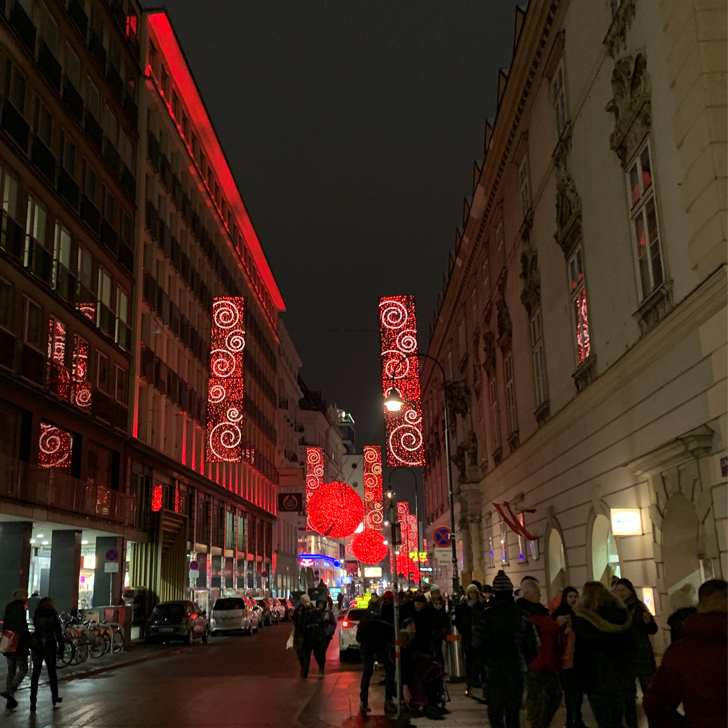 By now dusk was slowly setting in, so we headed down Kärntnerstraße towards the Stephansdom (the cathedral), to glance at all the Christmas lights. 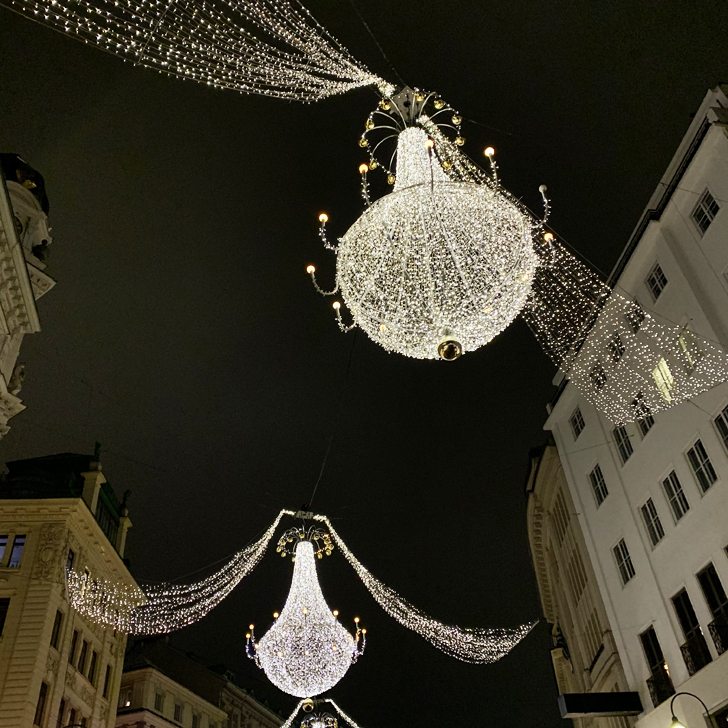 If there is one thing that makes Vienna even more special than all the Christmas markets dotted around town, it must be the magnificent Christmas lights on display everywhere. Each street has their very own style and they look just so pretty and magic… you can totally understand why they are called ‘fairy lights’. 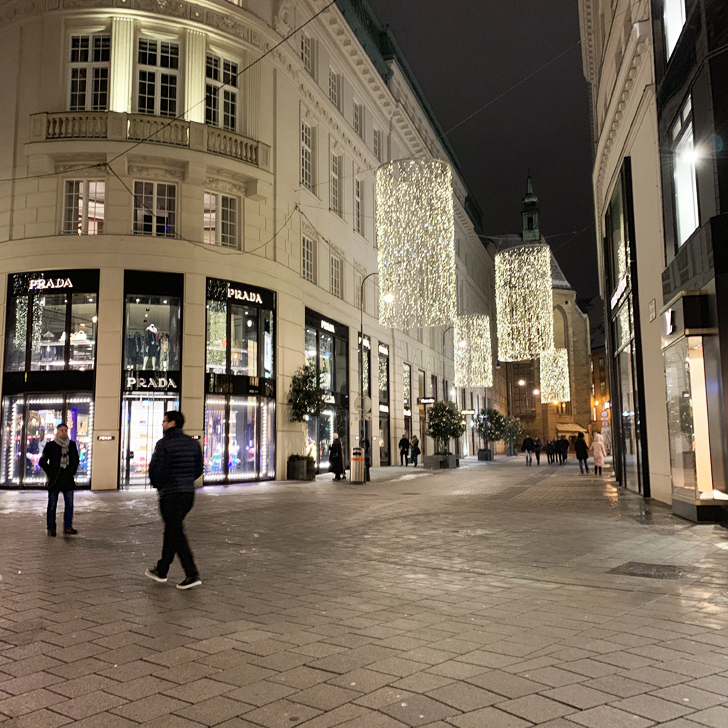 Somehow Vienna really managed to put Christmas lights everywhere without it looking tacky and over the top. Not sure what it was, maybe the fact that most of lights were white and static rather than moving / flashing. 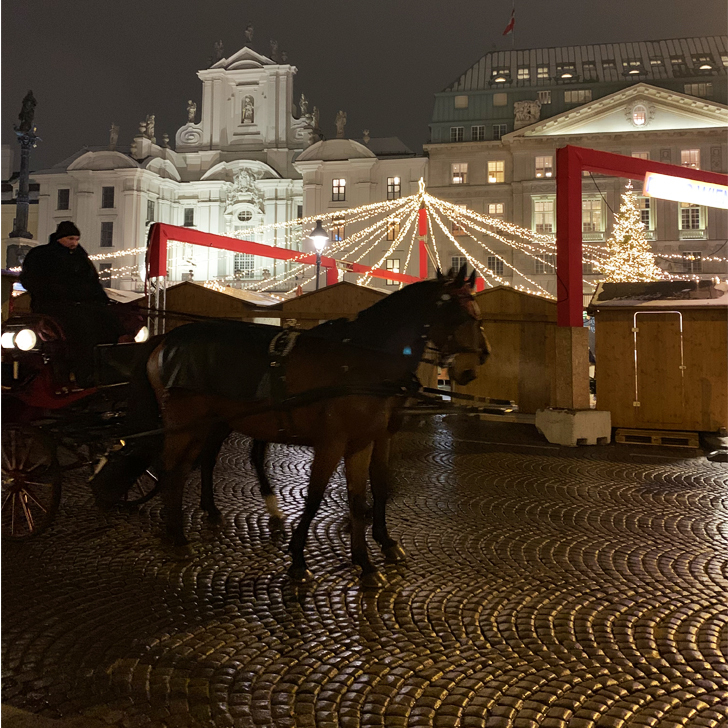 It just looked very elegant and sophisticated, none of that American winter wonderland / Disneyland atmosphere that you occasionally come across – and no, I am not saying there is anything wrong with that either, but I don’t think it would have suited Vienna very much. 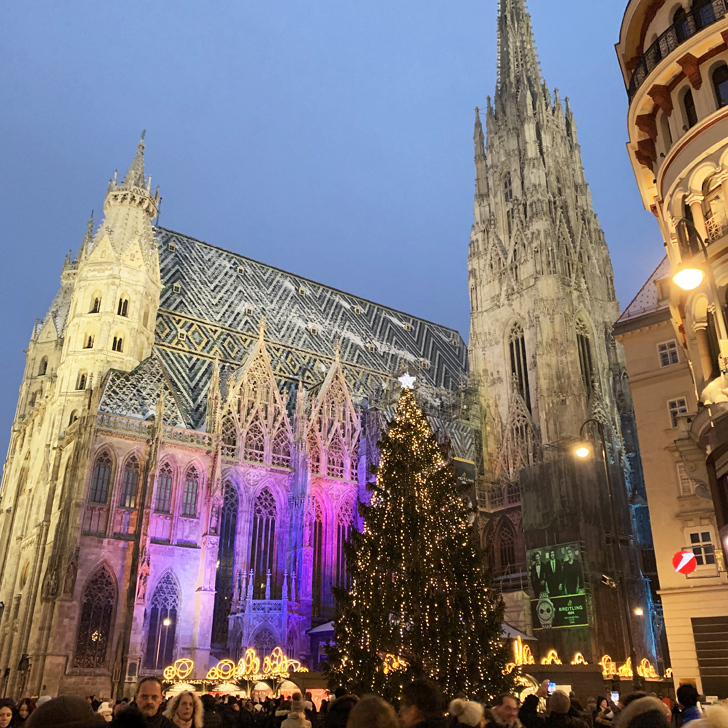 As we arrived at the Stephansdom, we stumbled across yet another Christmas market (I did check locations of Christmas markets on the internet before we arrived in Vienna, however this one wasn’t on the list). 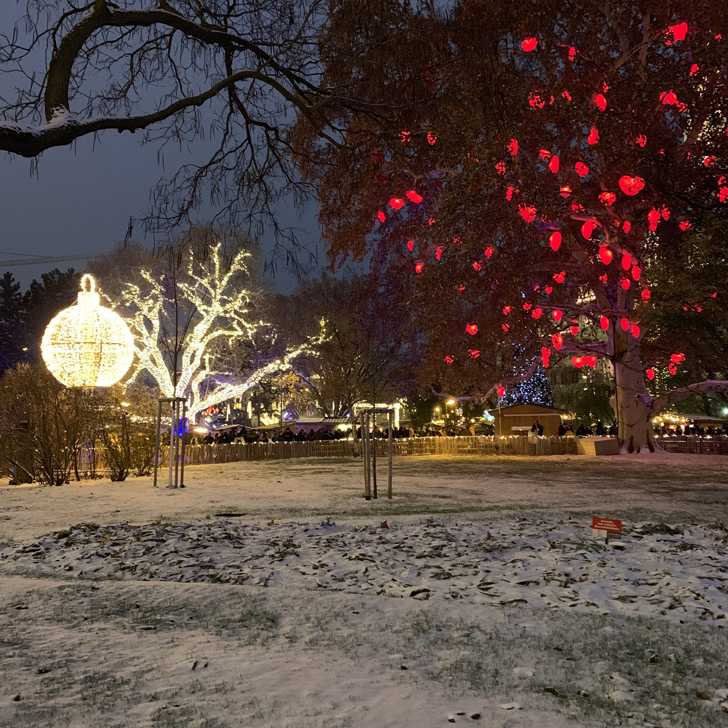 Nestling around the cathedral, with a beautiful big tree in front, it was once again picture perfect. Definitely time for another mulled wine. 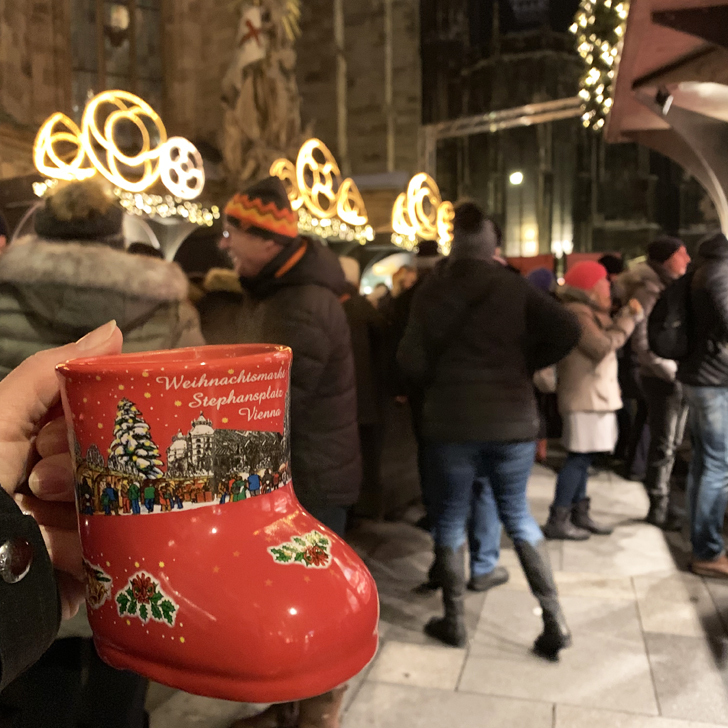 We really liked the fact that every Christmas market had their own mug for the mulled wine, so if you are into souvenirs, collecting one of each would be the way to go – we were well behaved and only brought back one – the one from the Stephansplatz Market. Are you still counting? Correct, Christmas market number 6. 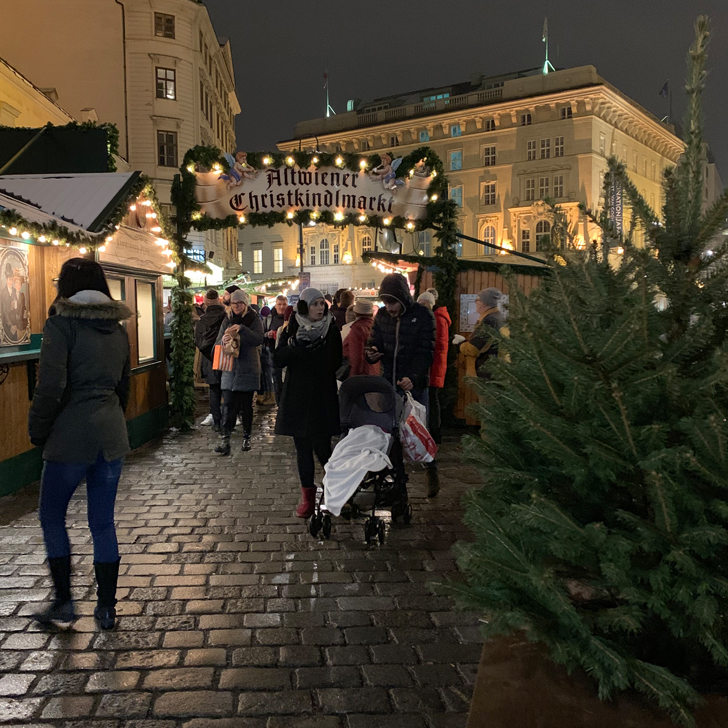 Shortly followed by the Altwiener Christkindlmarkt (Old Vienna Christmas Market). And the Karitativer Weihnachtsmarkt (charity christmas market) right opposite. 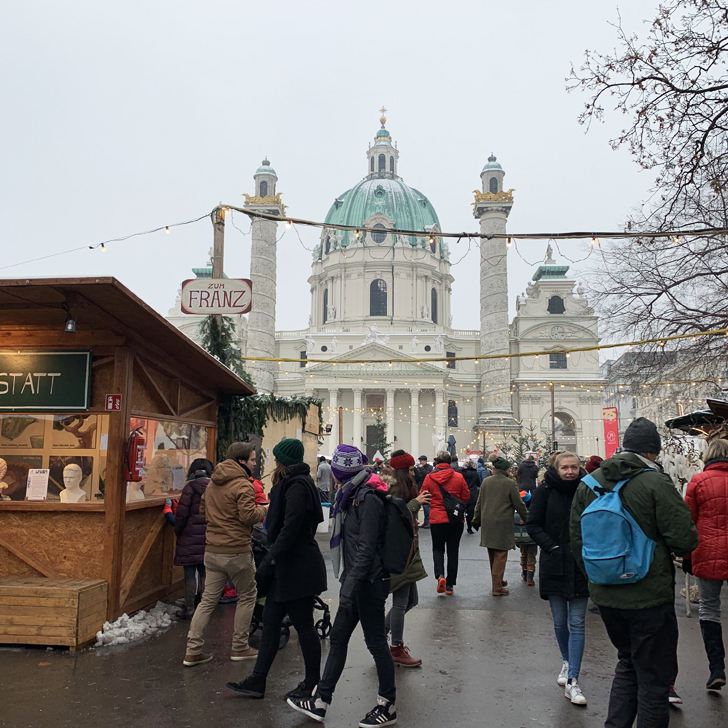 By now we were getting a little tired, so decided to slowly walk back towards the hotel, but not without strolling through the Christkindl Market at the Rathaus once more (and snapping another half a million photos obviously). With our flights on Monday afternoon, we still had half a day to spend. 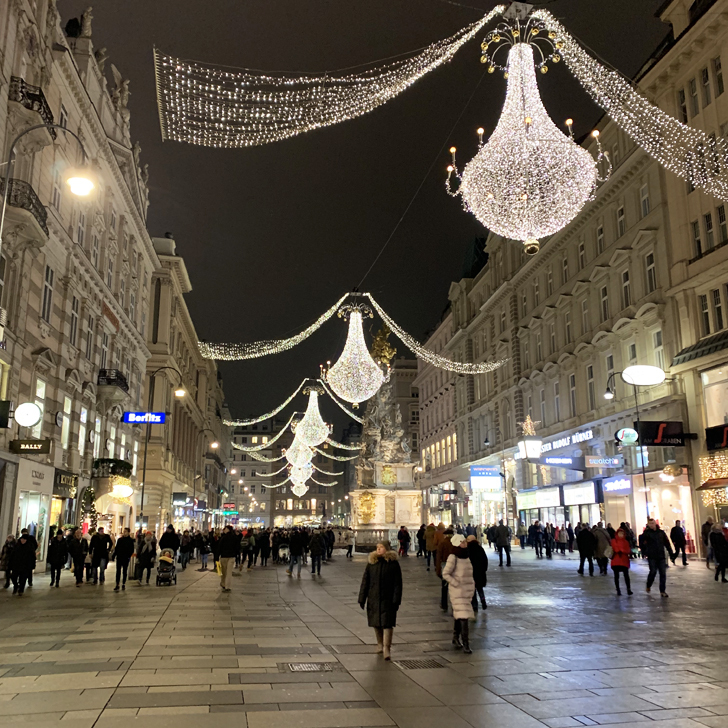 As it was raining (and as we had kind of overdosed a little on Christmas markets the previous day), we opted for a ‘Christmas market free day’ and walked back towards the Stephansdom (so still passing 4 Christmas markets, not quite market free after all) for a little shopping. 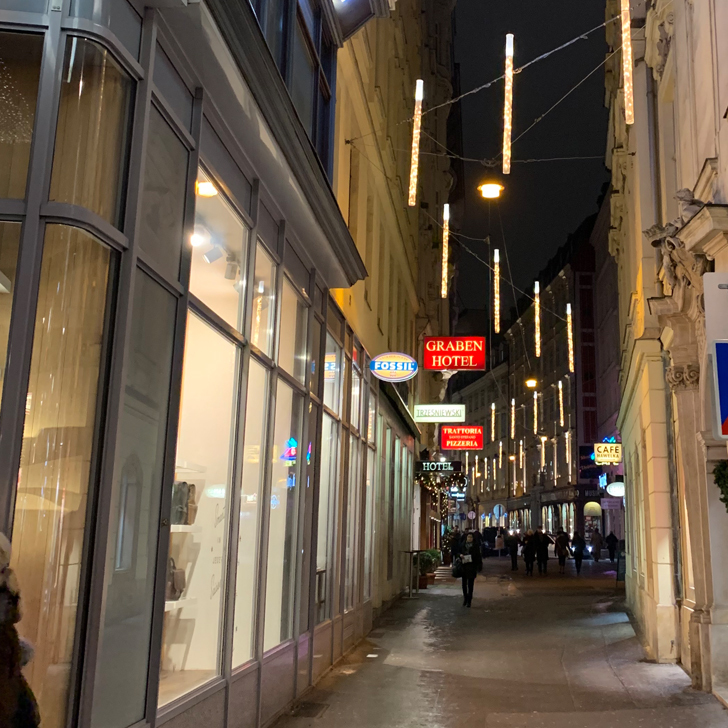 So far I’ve always been lucky when shopping in Vienna and always seem to come home with a special little something (from beautiful green leather gloves to silk scarves and designer heels, I’ve had it all). And most of it was bought at Steffl, my favourite shop on Kärntnerstraße. 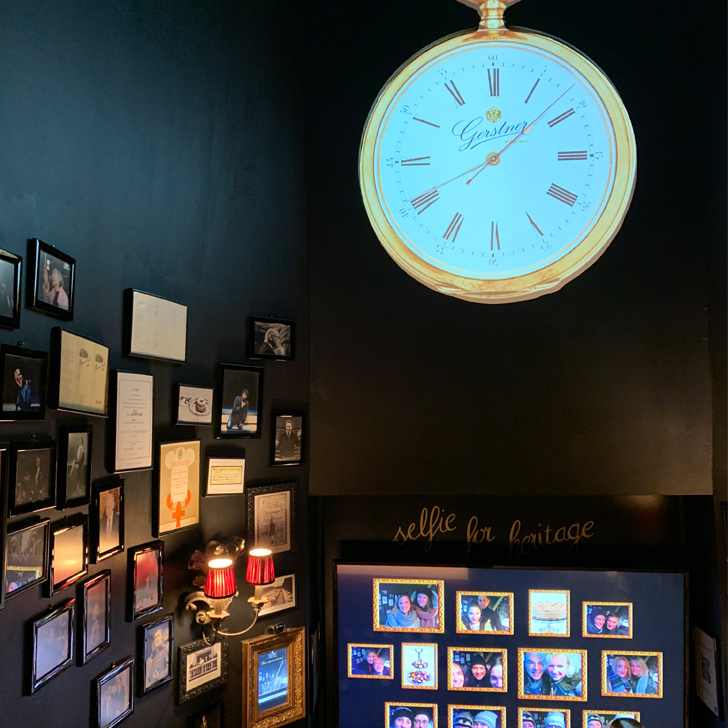 So no way was I leaving Vienna without visiting Steffl again. And for anyone that knows me, it shouldn’t come as a surprise that I ended up buying myself a new winter coat there (thank goodness that the beautiful Jimmy Choo heels I had my eyes set on first weren’t available in my size anymore). To my defence, I needed a new coat anyway AND it was half price. Jackpot. (underground station ‘Rathaus’, line U2), open daily 10am to 9.30pm. 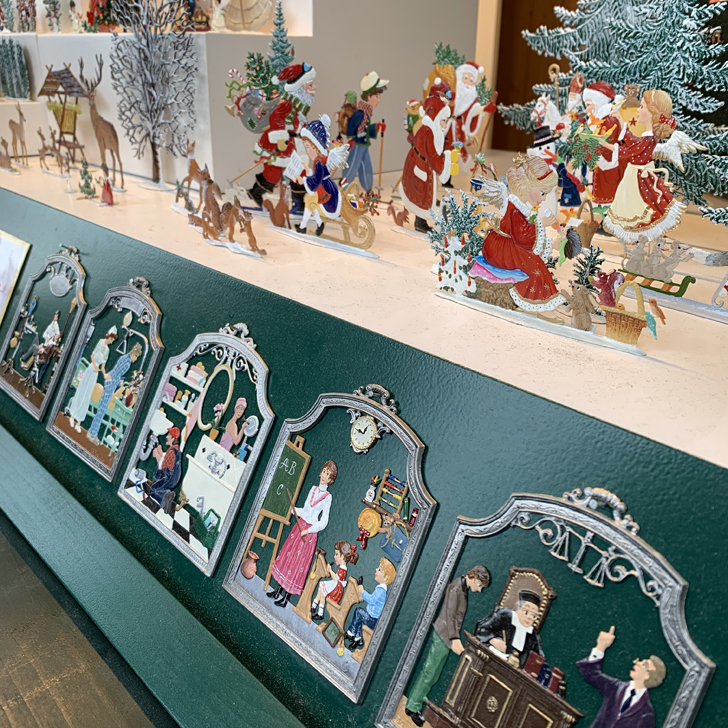 Platz am Hof (underground station ‘Schottentor’ line U2 or ‘Herrengasse’ line U3), open daily from 10am to 9pm. – Art Advent on Karlsplatz (underground station ‘Karlsplatz’, lines U1, U2 + U4). Open from 12 until 8pm. (underground station ‘Schönbrunn’ line U4), open daily 10am to 9pm. 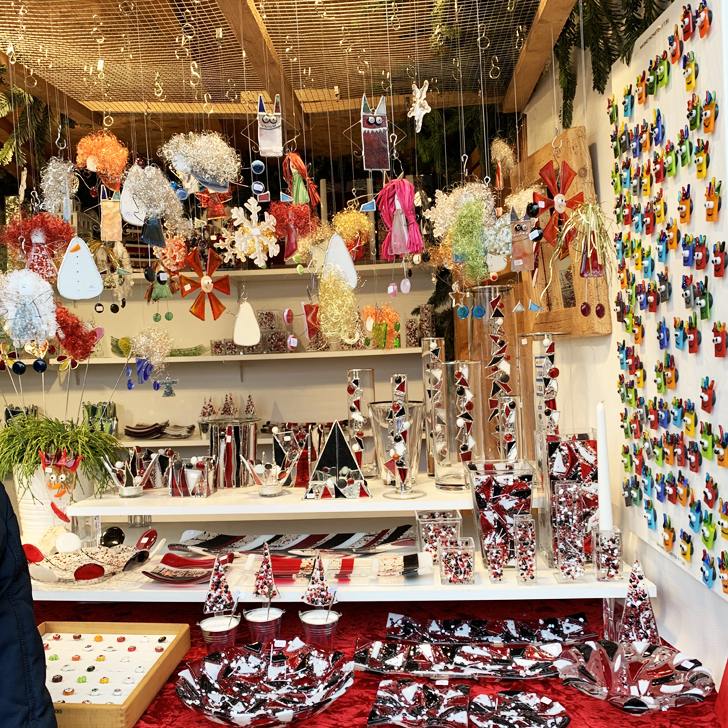 – Small Christmas market opposite the Opera House. 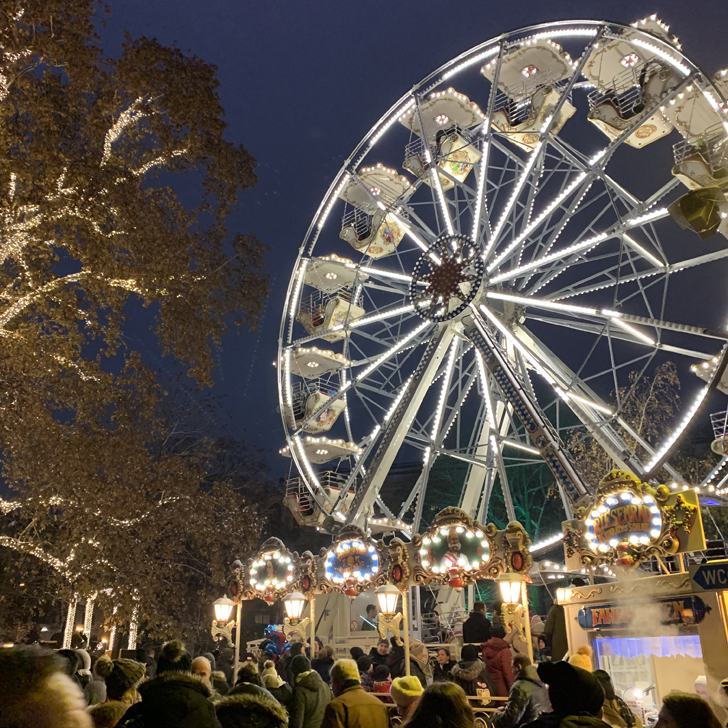 Most of the Vienna Christmas Markets are open daily from late morning to evening, however opening times do vary slightly, so it might be worth double-checking, in case you were planning on heading there very early or late. 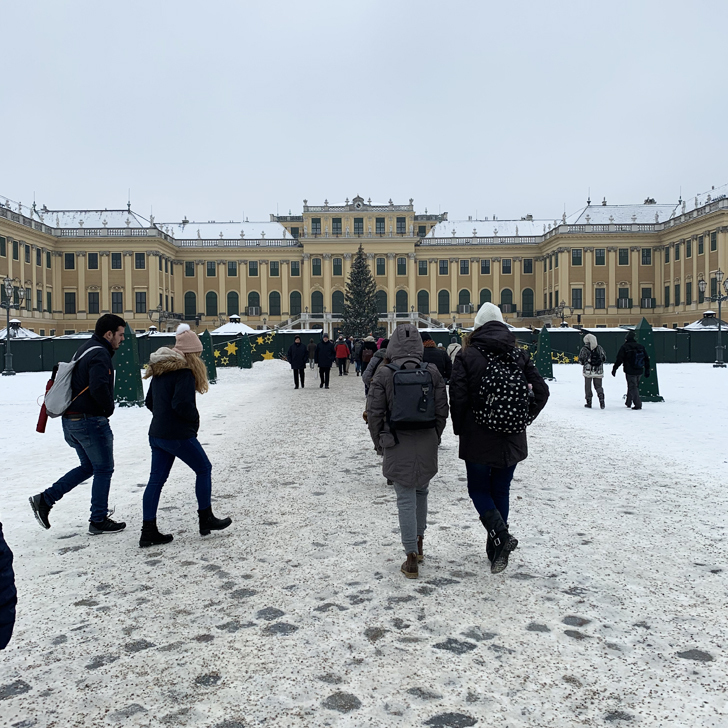 There are no entrance fees to any of the Vienna Christmas markets, but when heading to Belvedere or Schönbrunn, you will need to pay an entrance fee if you want to visit the castle as well. You will obviously need to pay for the fairground attractions and the ice rink. 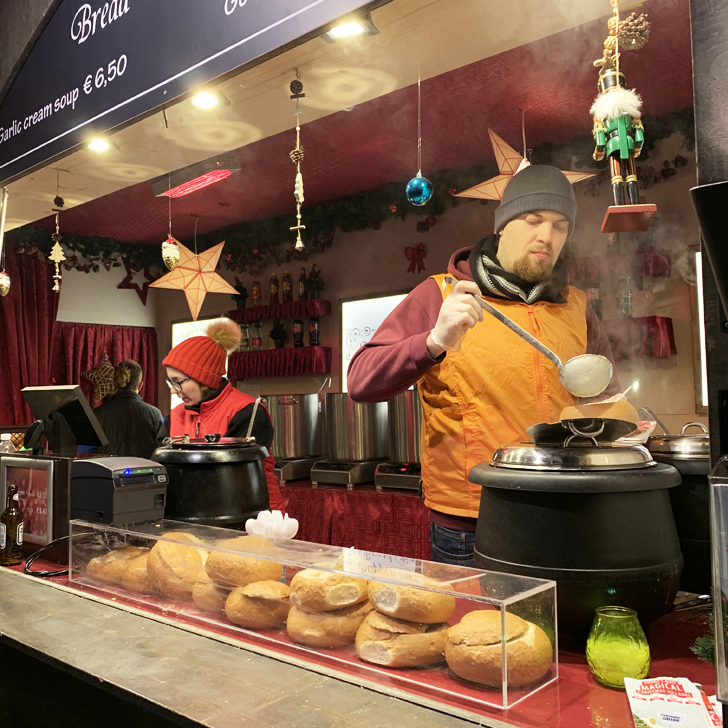 You will get different types of mulled wine (and non-alcoholic drinks) at all of the markets, prices are more or less the same at all of the markets and are around 4-5 Euros, depending on the type of mulled wine. 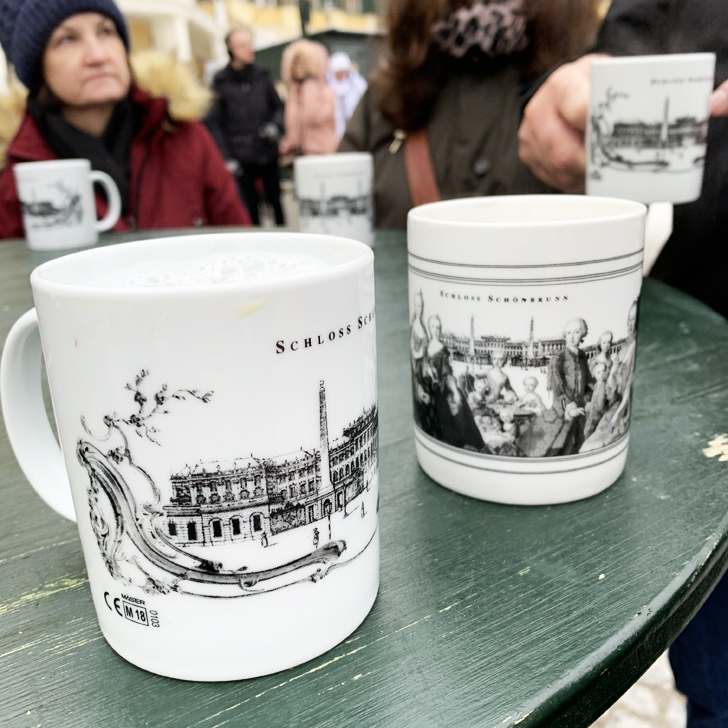 You will need to pay a deposit for the mug (we paid 3 Euros / mug at Schönbrunn, 4 Euros / mug at Stephansplatz). Whether you take the mug home as a souvenir or return it and get your money back is up to you obviously. Carry cash. 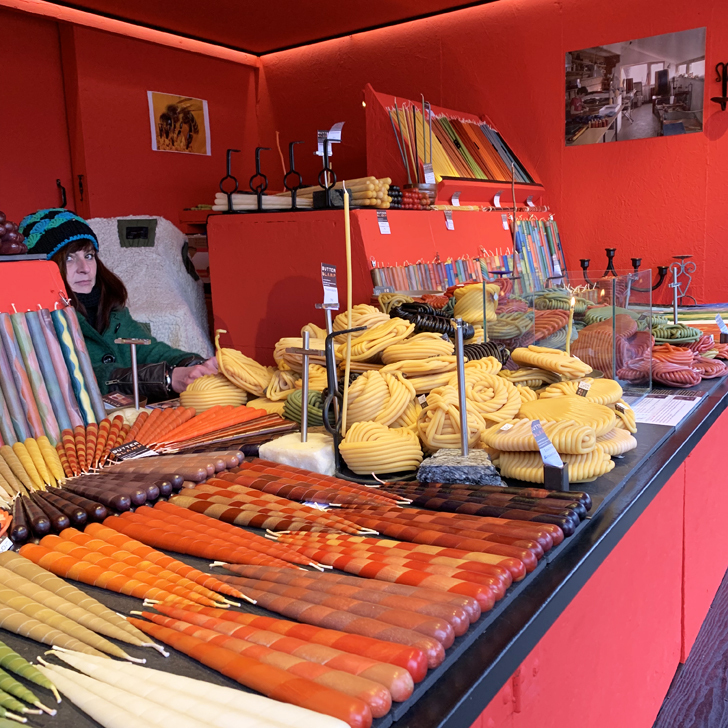 Whilst a few of the merchants will accept credit and debit cards, most of the food and drink stalls won’t. Keep an eye out for a ‘Bankomat’ sign, if you are looking for a cash machine. Be prepared for the weather. 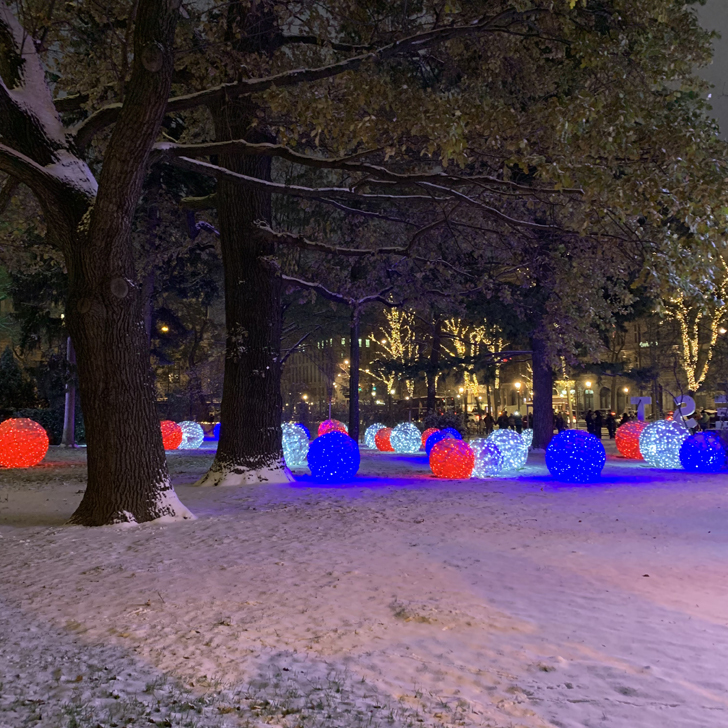 It can get quite cold in Vienna, so I would advise you bring warm boots and a hat (to protect you not just against the cold, but also against snow or rain). As some of the markets can get quite crowded, carrying an umbrella might not be the best option. Ensure you have some space in your suitcase. 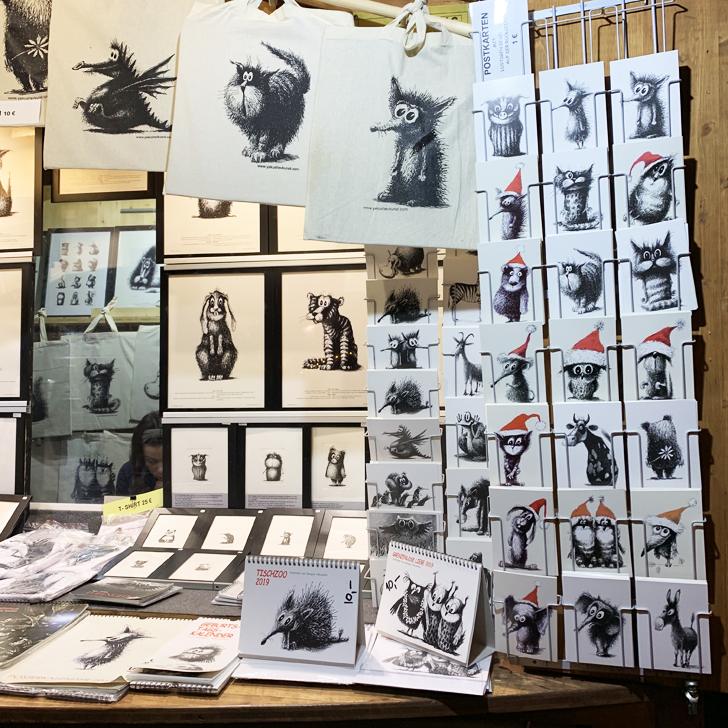 The market stalls are just perfect for picking up unusual and meaningful Christmas gifts. Pick up some local chocolates, jams and oils for your beloved ones. Or some handmade wooden toys for the kids? 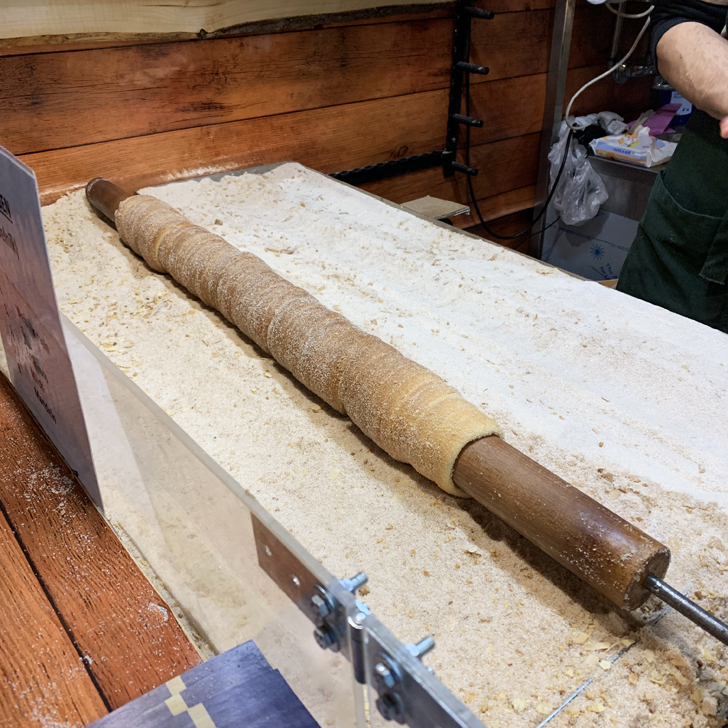 But don’t be tempted in buying the pre-packed bags of Mozartkugeln at the Christmas market. They are a little overpriced. Head to one of the supermarkets and buy them for half the price instead (and yes, they are the exact same ones). 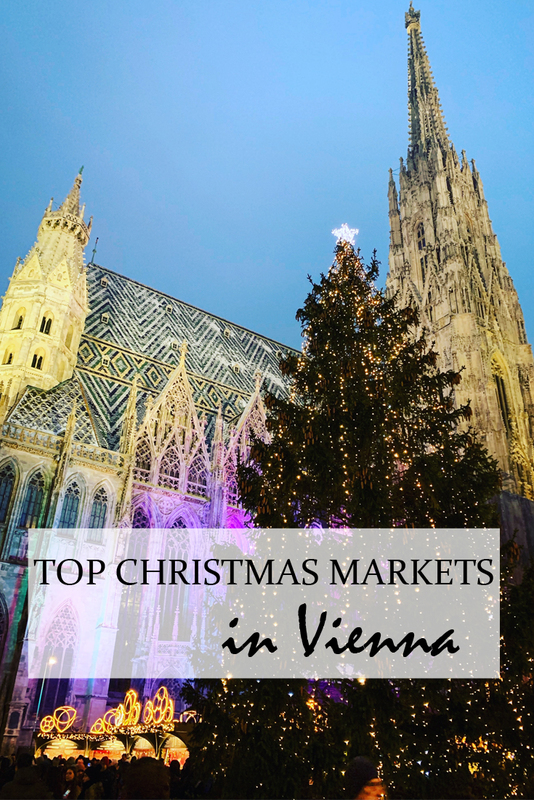 Which of the Vienna Christmas markets is the best? Good question, no answer. I liked them all. They all had their own identity and character. The big one at the Rathaus might be a bit more commercial than the smaller ones, but it sure makes up for that by the picturesque setting. So just go and visit them all. Being the “mum” Sarah talked about I can only agree with every bit said, the whole weekend has been magical and very special. Thanks Sarah.